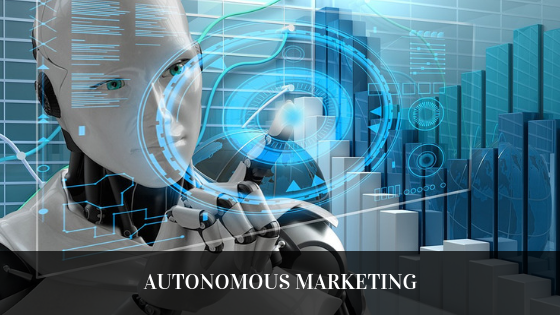 Marketing is becoming increasingly autonomous, meaning more and more of the touchpoints with consumers are created or managed by an automated system without direct human intervention. On its own, this isn’t new. We’ve had it for a while with marketing automation systems like HubSpot or Pardot that could nurture leads automatically and personalize content at basic levels. However, we are entering a world of fully autonomous marketing, and that is going to change everything. Many marketing tasks like purchasing ads, optimizing campaigns, managing the customer journey, or redesigning a landing page as part of conversion ratio optimization (CRO) efforts are all human tasks that are now being replaced by AI-bots that do this faster and more effectively. The same goes for content strategy and SEO optimization, CRM data enrichment, customer service engagements using chatbots, social media moderation, and much more. Right now, we still need marketing teams, but they are increasingly being relieved of the grunt work of analytics to focus on the creative and strategic side of the industry instead. It wasn’t long ago that everyone was talking about having a “mobile-first” strategy, meaning that businesses focused on customers accessing their online assets and services from mobile devices more often than from desktop computers. Today, mobile-first strategies are for laggards. We are now entering the “AI-first” world, where companies increasingly focus on introducing AI to nearly every level of their business. In fact, the AI-first mindset will transform many industries. We are racing towards a world of hyper-personalization, known in marketing as the segment of one (or audience of one). Spammy mass marketing is no longer acceptable, and such strategies will not be efficient going forward. With inbound content marketing becoming the norm, so are highly personalized customer experiences, with individualized marketing touch-points, where the right person gets the right message, in the right channel, at the right time. One can argue that AI will make marketing relevant again. For decades, the friendly and familiar corner shop of the past was replaced by mass media that lacked personalization or an understanding of each person’s context and needs. AI can enable us to place the customer in the center again and give personalized experiences throughout the customer journey. We can turn mass-marketing into a personal conversation, like the corner store of old. The difference today is that it is automated and done at unprecedented scale. AI will also make marketing more efficient and cost effective. Using machine learning algorithms, we can deploy self-learning systems that know how to optimize themselves to become continually better. Optimize what? Almost everything. There are even AI-tools that generate website designs automatically. Other tools can perform conversion ratio optimization, complete with automated design changes proposed, implemented, and tested by genetic algorithms. Unless you have studied the field of AI-driven marketing before, you will likely be shocked to learn what can be automated using machine learning today. Here, I give just an appetizer of the feast to come. We are entering a world where marketing decisions are based on billions or trillions of data points, easily outperforming the gut feeling of any skilled marketer. Marketing will not only be data-driven and fact- based, it will learn over time and optimize its own behavior. In other words, marketing systems will adjust automatically to changing customer behavior or other external factors. This raises an interesting question: Will marketers have a job in five years? If so, what will that job look like?